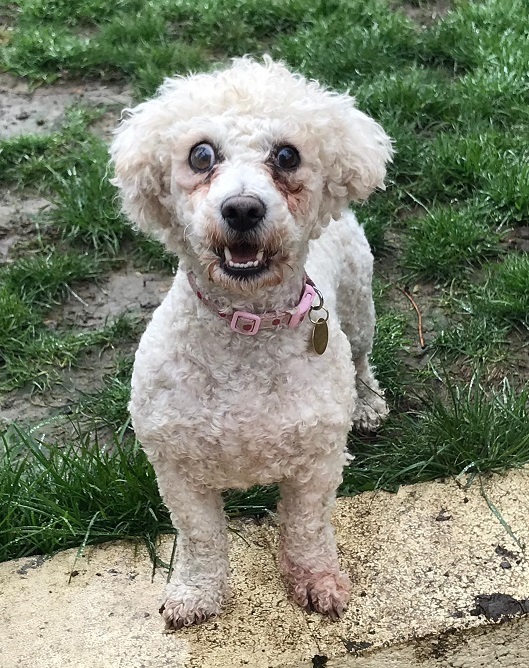 Miya is a 4 year old female Bichon Frise. Poor little Miya came to us via a group of wonderful people who help dogs listed for sale that are vulnerable. From Miya’s pictures it was very apparent that she had some issue with her eyes/sight. When we collected Miya her eyes were red raw, painful and bulging. Her nails were completely overgrown and she had sore patches on her skin. She was of course taken straight to our vets, her eyes were assessed and the raised pressure is causing problems and pain for her. We have started her on a course of treatment and she has been back to the vets today and her pressures are lower which is a good sign. 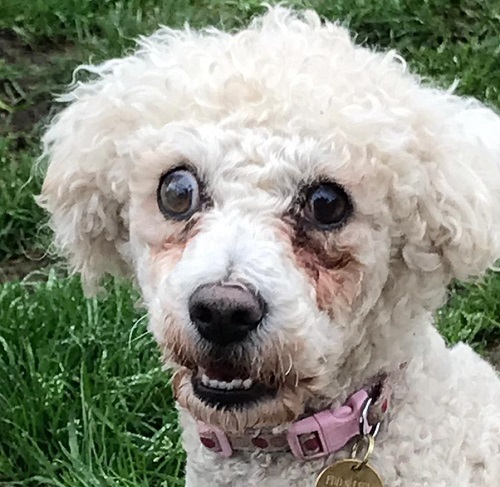 She does have cataracts also, we are unsure at this time if surgery will be an option, it will be dependent on how her eyes respond to treatment that she is currently receiving. There is a risk that she may loose one eye, we are doing all we can currently to try and save her sight. 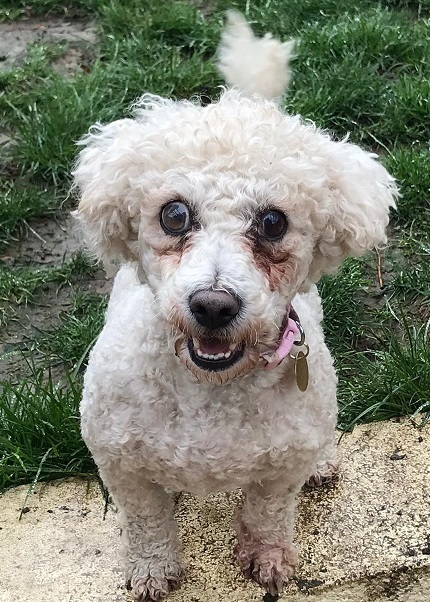 Miya is the happiest girl who is just so full of life, nothing slows her down or gets in her way and we would really like a home for her that will love her no matter what the outcome for her sight. She is beautiful regardless of whether she can see or not. 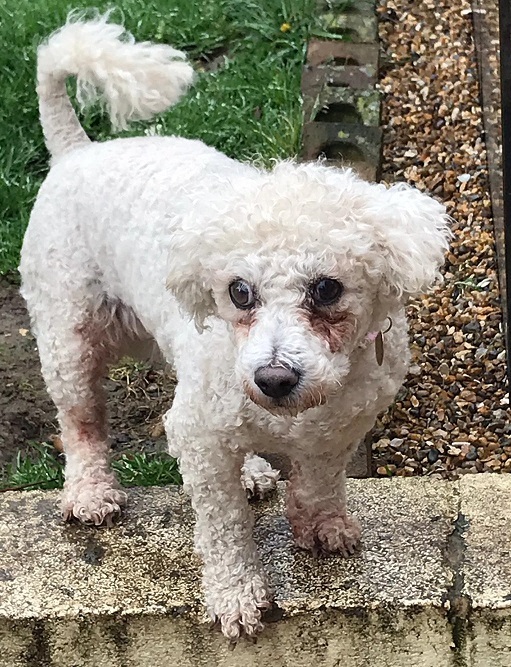 Miya may need to continue to see our vets for a little while so a home that is accessible to BR6 – Orpington Kent would be wonderful and would mean she could continue her treatment in her forever home. We know this is a long shot but it would be great for Miya. She would like new owners who are around for most of the day, a home where she will get plenty of walks as she does love being out and about. She is fine with other dogs but can be quit full on and playful. She has been around children but our preference would be for older children due to potential sight issues. She has had a few accidents in the home but is making good progress. 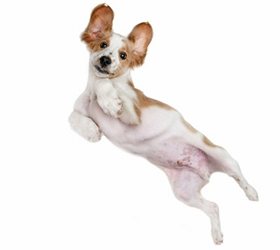 Miya has been neutered, vaccinated and micro chipped and is up to date with flea and worming treatments. She is currently being fostered in Swanley Kent.